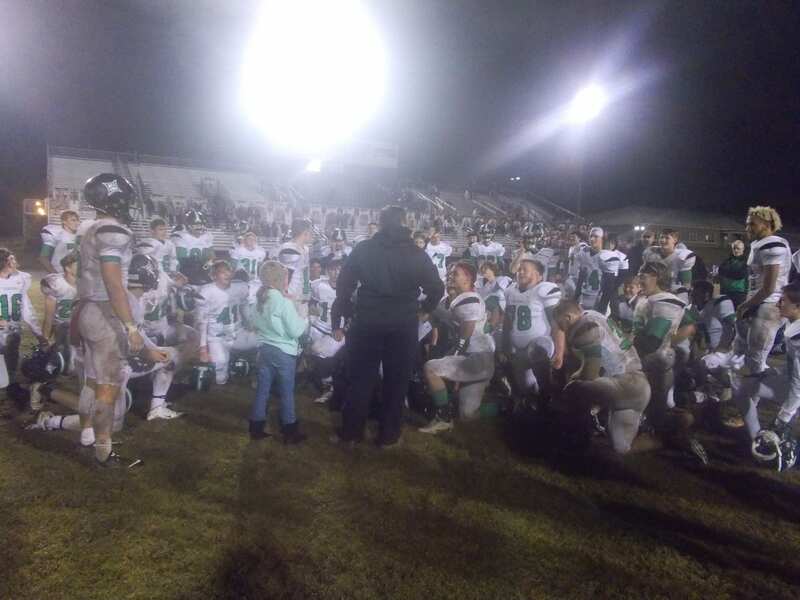 This past Friday, it was a cold, drizzly night in Pickens County as the PHS Dragons varsity football team hosted the White County Warriors for the 1st round of the GHSA 4-A State Playoffs. White County, came into the game as the #4 seed from region 7, while the Dragons came in as the #1 seed from region 6. These two teams met earlier in the season as you may recall, with Pickens coming away with a 42-35 win. The Dragons, won the toss & deferred to the 2nd half. White County, would manage a first down on their opening possession, but that would be all the Dragons defense would give up. On offense, the Dragons used the ground game & capped off their opening drive with points as QB CJ Streicher got in from 9-yds out to make it 7-0 Pickens, with 7:30 to go in the 1st quarter. Pickens then came up big on defense as the Warriors decided to go for it inside Dragon territory & were unsuccessful. Two plays later, Streicher found Zach Goss streaking down the far sideline & the Senior did the rest as he took it to the house for an 83-yd touchdown. As we headed to the 2nd, the Dragons were on top, 14-0. The Dragons would add to their lead at the 9:17 mark of the 2nd quarter after Senior Michael Burrell made several moves including a fancy spin at the end of his 8-yd touchdown run, making it 21-0. The defense for Pickens once again came up big as a pass attempt by the Warriors was deflected, & Senior Chase Jarrett made a diving grab to nab the interception. The Dragons turned that turnover into points when Brady Moore ran it in from 29-yds out to make it 28-0, with 5:40 left in the first half. Just before the end of the half, another Dragon Senior, Trevon Hawkins, punched it in from 1-yd out, giving Pickens a 35-0 lead over White County heading into the break. There was only one scoring drive in the 2nd half and that came on a 5-yd touchdown run from Jarod Whitmore in the 3rd quarter. 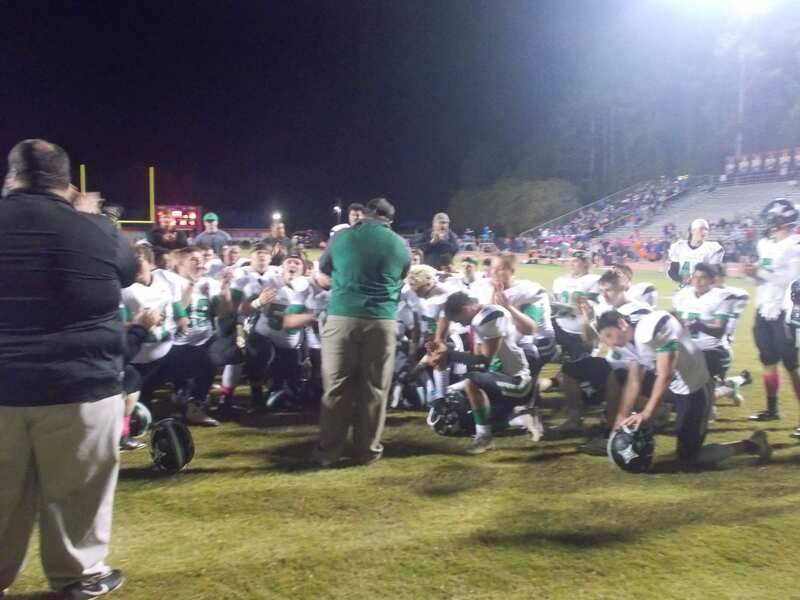 Pickens, wins it’s first ever playoff game, 42-0. Next week, the Dragons will again be home for the 2nd round of the 4-A Playoffs as they will welcome the Troup County Tigers to Jasper. Troup, is 10-1 on the season, & the #2 seed out of region 5. This will be the first meeting between the two schools in football. Kickoff set for 7:30 pm. 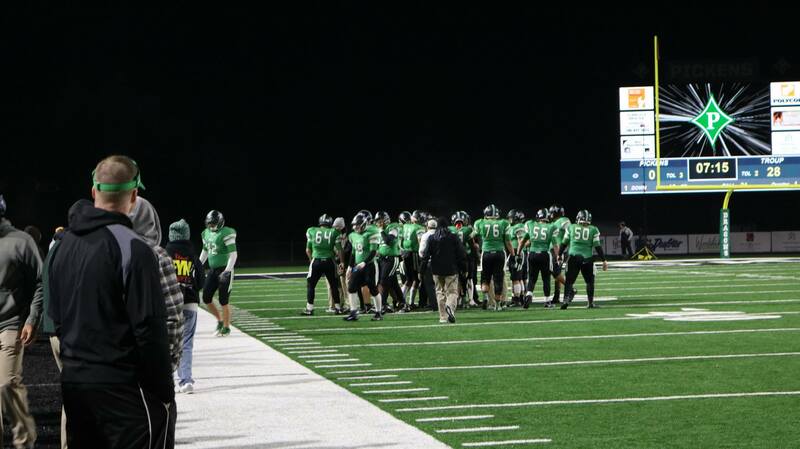 Last night, the PHS Dragons varsity football team hosted the Ridgeland Panthers for Senior Night. Not only was it Senior Night, it was a region championship game. With Pickens sitting at 4-0, & Ridgeland sitting at 3-0 in the region, this became the deciding game for the 6-AAAA crown. Prior to the ball game, the Seniors for the team, cheerleaders, & band were all recognized. The most special one, was Jordan Simonds. Simonds, lost his life in an automobile accident last year. This would’ve been his Senior year. Jordan’s mother, Jessica, represented him. She was surrounded by Jordan’s fellow Seniors, & was presented a bouquet of flowers. The Simond’s family has set up a Memorial Scholarship fund in his name. If you haven’t already, please go contribute in any way you can. Pickens won the toss, but elected to defer to the 2nd half, giving Ridgeland’s speedy offense first possession. After a big loss on 3rd down, the Panthers were forced to punt from the back of their own end zone. The Dragons took over at the Ridgeland 30-yd line. It took Pickens one play from scrimmage to find points as the Dragons worked the double pass to perfection. CJ Streicher sent it over to Michael Burrell, then Burrell connected with a wide open Brady Moore for a 30-yd TD pass, giving the Dragons a 7-0 lead, with 11:27 to go in the 1st. Pickens looked to catch the Panthers off guard again with a surprise onside attempt, but were unable to recover it. Ridgeland used the good starting field position to drive down the field, & cap it off with a 3-yd TD run to make it 7-7 with 9:59 left in the 1st. Ridgeland then took the lead after a 47-yd TD pass, to make it 14-7, with 7:45 left in the opening quarter. The Dragons, were able to drive down the field, and get a 21-yd field goal from Jose Sanchez to make it 14-10 Ridgeland, going to the 2nd. Pickens, regained the lead at the 9:36 mark of the 2nd quarter after Robert Davis barreled his way in from 7-yds out, to make it 17-14. Ridgeland, looked to tie things up with a long field goal attempt, but Kaleb Ray came swooping from the left side and blocked the kick, giving the Dragons possession at their own 27-yd line. On the very next play, Streicher found an open Ray near the sideline & he took it 73-yds for the score, giving Pickens a 24-14 lead, as we’d head into halftime. The Dragons, got the ball to start the 2nd half, & methodically drove it down the field, chewing up nearly half of the 3rd quarter on their first drive. The drive ended with Davis getting into the end zone from 13-yds out after nearly losing it prior to scoring. That made it 31-14 Dragons, going to the 4th. The defense for Pickens, as they have all season long, really stepped up in the 2nd half shutting down the high powered Panther offense. Ridgeland’s only other score came with 19 seconds left to go in the game. Your final in this one, Pickens 31, Ridgeland 21. With the win, Pickens secures it’s first region championship in school history. 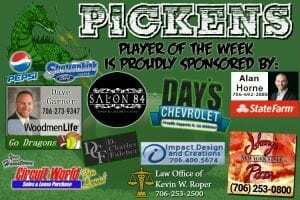 Pickens, will look to complete it’s first ever undefeated season next week when they travel to Walker County to take on the LaFayette Ramblers. Game time is set for 7:30. 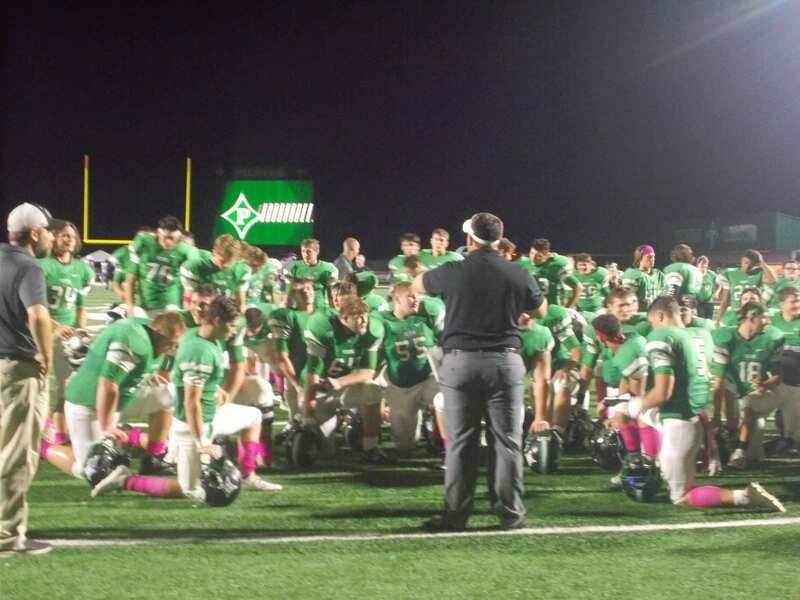 This past Friday night, the PHS Dragons varsity football team traveled to Northwest Whitfield to take on the Bruins in a crucial region ball game. The past couple of seasons, the Bruins have gotten the better of the Dragons, winning the last 3 match ups. 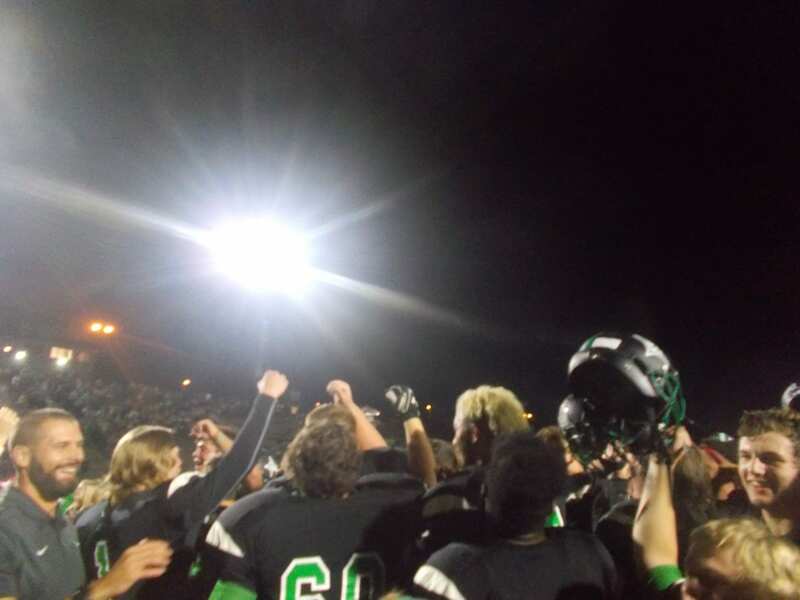 Pickens looked to end that streak & stay atop the 6-AAAA standings. The Northwest Whitfield Bruins got the ball first on offense. The Dragon defense came out aggressive & forced the Bruins to punt. 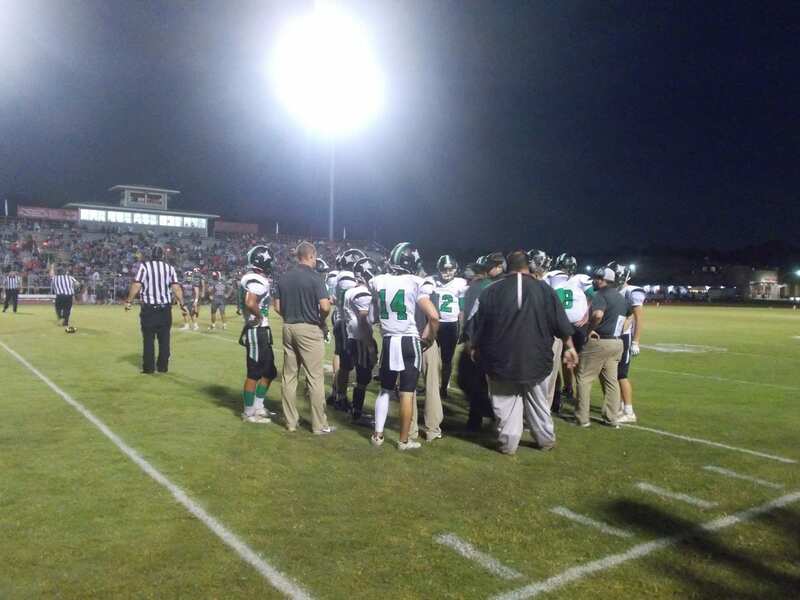 The first possession for Pickens ended with 6 as the offense drove down the field, & the drive was capped off by a 2-yd TD run for CJ Streicher to put the Dragons ahead, 7-0, with 7:53 left in the opening quarter. The Dragon defense again came up with a big stop, & gave the offense good field position to work with. Pickens again marched down the field & would score after a 2-yd TD pass from Streicher to Hunter Hermann, who was all alone in the back of the end zone. Going to the 2nd quarter, the Dragons held a 14-0 advantage. In the 2nd, the Dragons added to their lead after the defense again set them up with prime field position & Robert Davis would find the end zone from 4-yds out, to give Pickens a 21-0 lead, with 7:43 left in the 1st half. Streicher scored his 2nd rushing TD of the game 6:14 mark of the 2nd quarter to make it 28-0. This score, again was set up by a swarming defense. After a big kick off return, the Bruins got their first points of the game after a 9-yd run at the 5:05 mark of the 2nd. Northwest Whitfield tried to catch the Dragons off guard by using the swinging gate formation & tried to go for 2, but Pickens had it figured out from the start & stopped it. Giving us a score of 28-6. Just before the first half came to an end, the Dragons looked to add to their lead and add to it they did. Streicher connected with Zach Goss from 34-yds out to give Pickens a 35-6 lead at the break. The Dragons, got the ball to start the 2nd half, & wasted little time picking up where they left off in the first half. Streicher & Goss hooked up for the 2nd time on the night, this time from 53-yds out. Pickens, took a 41-6 lead with 10:02 left in the 3rd. Davis, got his 2nd score of the night at the 5:50 mark of the 3rd as he was able to get in from 5-yds out, to make it 48-6. Another good kick off return by the Bruins helped set them up for a score as they got in after a 6-yd pass to make it 48-13 Dragons going to the 4th. Pickens, got the only points in the 4th as Jarod Whitmore got past several Bruin defenders to score from 20-yds out. The final score in this one would be 55-13, Pickens. Next week, the Dragons will host the Ridgeland Panthers. This game, will more than likely determine the region champion for 6-AAAA. Kick off is set to start at 7:30. This week’s #TeamFYNSports Sports Writer Player of the Week is Junior QB CJ Streicher. This is Cj’s 2nd player of the week honor this season. Streicher, had a big game this past Friday night against 515 rival, Gilmer Bobcats. Streicher, was effective through the air and on the ground. Streicher finished with 121 yards passing, completing 7 of 8 attempts, 3 of those 7 completions went for touchdowns to three different receivers. Streicher also ran for 124 yards & scored on a 52-yd TD run. 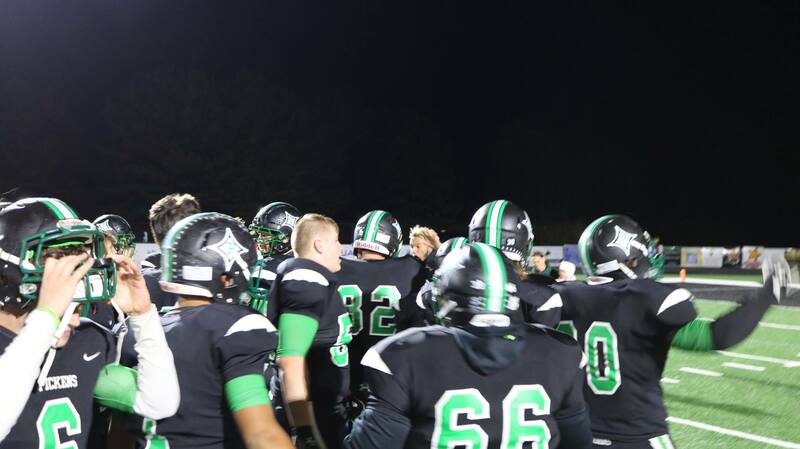 On the night, Streicher finished with 245 yards of total offense & 4 total touchdowns helping the Dragons get a 55-6 win over Gilmer, & the first 5-0 start to a season for the Dragons since 1986. 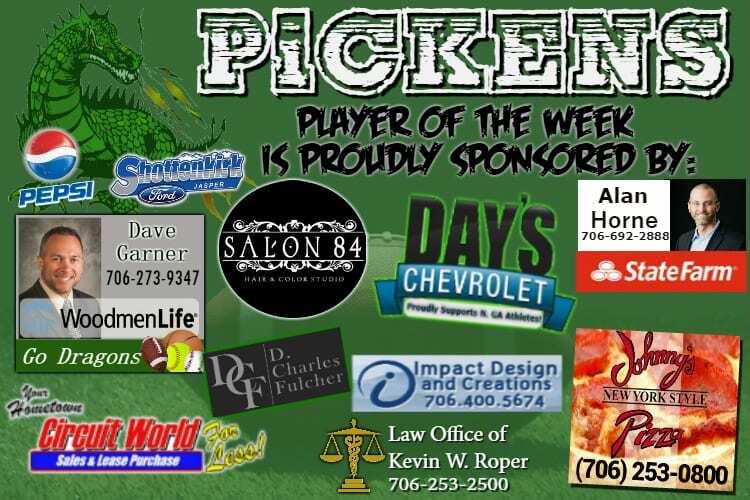 You can catch CJ Streicher & the rest of the Pickens Dragons in action next Friday as they take to the road to take on the Southeast Whitfield Raiders.